The 38th Middlesex (Artists) Rifle Volunteers was formed in 1860 by Edward Sterling. At first the regiment largely consisted of painters, sculptors, engravers, musicians, architects and actors. Over the years several outstanding artists, including 2 Presidents of the Royal Academy, served in the Regiment. The artists included Everett Millais, G F Watts, Frederick Leighton, Holman Hunt and William Morris. During the First World War the Regiment included Charles Jagger, Bert Thomas, Robert Sherriffs, Barnes Wallis, Edward Thomas, Paul Nash, John Nash and John Lavery. For many years the Artists Rifles provided a Guard of Honour on the occasion of the Academy's Annual Dinner. 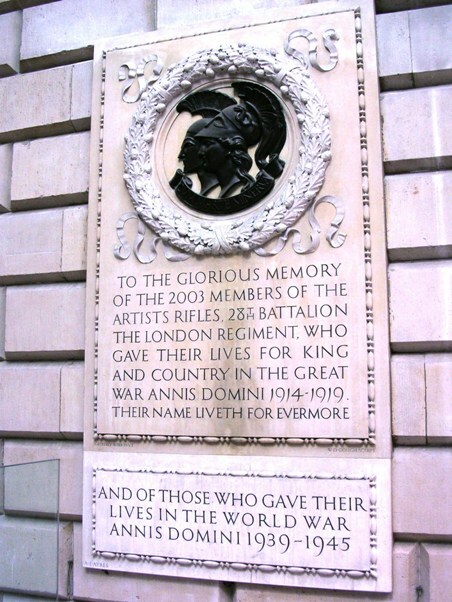 In November 1920, the Royal Academy Council resolved to give the wall of the east side of the portico of Burlington House to a War Memorial for the Artists Rifles Corps. This memorial was designed by Geoffrey Webb to correspond with Trentwith Wills design for a War Memorial to the students of the Academy Schools on the opposite wall. The sculptor was W.D. Gough. Both memorials were unveiled by General the Earl of Cavan, Chief of the Imperial Staff and dedicated by the Dean of Westminster on 12 May 1922. The inscription on the Artists Rifles Memorial reads: "To the glorious memory of the 2003 members of the Artists Rifles, 28th Battalion the London Regiment, who gave their lives for King and Country in the Great War Annis Domini 1914-1919. Their name liveth forever more." An additional tablet sculpted by Arthur Ayres was added after the 2nd World War. Its inscription reads "And of those who gave their lives in the World War Annis Domini 1939-1945." The memorial is rectangular, in total 1370mm wide, 2518mm high, of bronze on stone. Above the inscription is the bronze profile heads of Mars and Minerva, which are encircled by an oak wreath carved into the stone. The Victoria Cross Decoration was instituted on 29th January 1856, for the purpose of signalising special individual acts of bravery. It may be conferred on any rank. The Badge consists of a Bronze Cross with the Royal Crown in the centre and underneath a scroll bearing the inscription “For Valour.” The colour of the ribbon is red. Hooge, Belgium, between 25th September and 1st October 1915. For most conspicuous bravery and devotion to duty. 2/Lt. Hallowes displayed throughout these days the greatest bravery and untiring energy, and set a magnificent example to his men during four heavy and prolonged bombardments. On more than one occasion he climbed up on the parapet, utterly regardless of danger, in order to put fresh heart into his men. He made daring reconnaissances of the German positions in our lines. When the supply of bombs was running short he went back under heavy shellfire and brought a fresh supply. Even after he was mortally wounded he continued to cheer those around him, and to inspire them with fresh courage. Hohenzollern Redoubt, France, September 29th 1915. For most conspicuous bravery. 2/Lt Fleming-Sandes was sent to command a company, which at the time was in a very critical position. The troops on his right were retiring, and his own men, who were much shaken by continual bombing and machine-gun fire, were also beginning to retire, owing to a shortage of bombs. Taking in the situation at a glance, he collected a few bombs, jumped on to the parapet in full view of the Germans, who were only twenty yards away, and threw them. Although very severely wounded almost at once by a bomb, he struggled to his feet and continued to advance and throw bombs till he was again severely wounded. This most gallant act put new heart into his men, rallied them, and saved the situation. St. Eloi , France, 27th to 29th March 1916. For most conspicuous bravery. During heavy fighting on three consecutive days he repeatedly went backwards and forwards under continuous and heavy shell and machine gun fire, between our original trenches and those captured from the enemy in order to tend and rescue wounded men. He brought in ten badly wounded men on the first day from the ground swept by machine gun fire and three were actually killed while he was dressing their wounds. The battalion to which he was attached was relieved on the second day, but he went back and brought in twelve more wounded men. On the night of the third day he took charge of a party of volunteers, and once more returned to the trenches to rescue the remaining wounded. This splendid work was quite voluntary on his part, and outside the scope of his ordinary duties. Near Hamel, France, 1st July 1916. For most conspicuous bravery. From 7 p.m. till midnight he searched “No Man’s Land,” and brought in three wounded men. Next morning at 8 a.m. he continued his search, brought in another wounded man, and gave water to others, arranging for their rescue later. Finally, at 10.30 a.m., he took out water to another man and was proceeding further on when he was himself killed. All this was carried out in full view of the enemy, and under direct machine gun fire and intermittent artillery fire. He set a splendid example of courage and self-sacrifice. Near Le Transloy, France, 5th November 1916. For most conspicuous bravery in action when in command of the second wave of the attack. Finding that the first wave had suffered heavy casualties, its commander killed and the line wavering, Lieut. Bennett advanced at the head of the second wave, and by his personal example of valour and resolution reached his objective with but sixty men. Isolated with his small party, he at once took steps to consolidate his position under heavy rifle fire and machine gun fire from both flanks, and, although wounded he remained in command directing and controlling. He set an example of cheerfulness and resolution beyond all praise, and there is little doubt that but for his personal example of courage the attack would have been checked at the outset. East of Bouchavesnes, France, 8th March 1917. For most conspicuous bravery and self-sacrifice. When engaged with some other men in deepening a captured trench, this officer struck with his spade a buried bomb, which immediately started to burn. 2/Lt. Cates, in order to save the lives of his comrades, placed his foot on the bomb, which immediately exploded. He showed the most conspicuous gallantry and devotion to duty in performing the act, which cost him his life, but saved the lives of others. N.W of Lens, France 24th to 26th September, 1918. For most conspicuous bravery, skilful command, and devotion to duty when holding, with his platoon, an advanced post established in a newly captured enemy trench northwest of Lens. The left flank of the position was insecure, and the post, when taken over on the night of September 24th was ill prepared for defence. Shortly after the post was occupied the enemy attempted, without success to recapture it. Under heavy machine gun consolidation was continued, and shortly after midnight another determined attack was driven off. Throughout the night Lieut Dean worked unceasingly with his men, and about 6 a.m. on September 25th a resolute enemy attack, supported by heavy shell and trench mortar fire, developed. Again, owing to the masterly handling of his command. Lieut Dean repulsed the attack, causing heavy enemy casualties. Throughout the 25th and the night of September 25th-26th consolidation was continued under heavy fire, which culminated in intense artillery fire on the morning of the 26th when the enemy again attacked and was finally repulsed with loss. Five times in all (thrice heavily) was this post attacked and on each occasion the attack was driven back. Throughout the period, Lieut Dean inspired his command with his own contempt of danger, and all fought with the greatest bravery. He set an example of valour, leadership and devotion to duty of the very highest order. Bellenglise , France , 29th September 1918. For most conspicuous bravery, devotion to duty and fine leadership during the attack at Bellenglise and Lehaucourt. He led his battalion with great skill across the Canal du Nord through a very thick fog and under heavy fire from field and machine guns. On reaching the high ground above Bellenglise the whole attack was depended on the advance going forward with the barrage, Lt-Col. Vann rushed up to the firing line and with the greatest gallantry led the line forward. By his prompt action and absolute contempt for danger the whole situation was changed, the men were encouraged and the line swept forward. Later he rushed a field gun single-handed and knocked out three of the detachment. The success of the day was in no small degree due to the splendid gallantry and fine leadership displayed by this this officer. Lt-Col Vann, who had on all occasions set the highest example of valour, was killed near Ramicourt four days later, when leading his battalion in attack. Click the Search button above to display the 1914 -1919 Roll of Honour listed in Country-Cemetery order.